Most of the cast for the Hillsboro High School production of the musical “Oklahoma” is pictured during rehearsal this week. The show will take the stage at 7 p.m. Friday and Saturday and 3 p.m. Sunday. 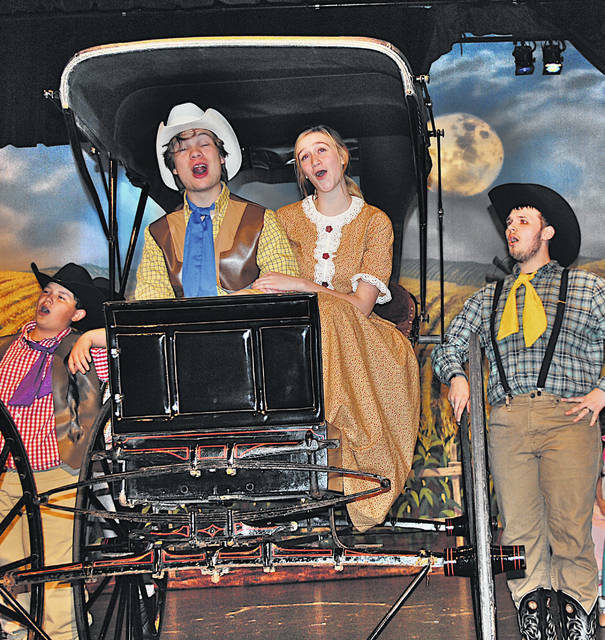 Hillsboro High School’s largest theatrical production of the year, the Rodgers and Hammerstein musical classic “Oklahoma,” will take the stage Friday, Saturday and Sunday at the high school auditeria. Show times are 7 p.m. Friday and Saturday and 3 p.m. Sunday. Tickets are $10 for adults, $5 for students, and kids age 5 and under are free. Presale tickets will be available from 5-7 p.m. at the high school Thursday, and at the school during lunch. “Oklahoma” is Rodgers and Hammerstein’s first musical together, released in 1943. It is based on “Green Grow the Lilacs,” a 1931 play by Lynn Riggs. The cast includes Andrea Archie as Sylvie, Simon Gabel as Jud, Mark Gallimore as Andrew Carnes, Craig Goodwin as Fred, Christopher Jacky as Curly, Spencer Langston as Ike Skidmore, Macy Leatherwood as Ellen, Alexandra Martinez-Mendez as Gertie Cummings, Cameron Moots as Cord Elam, Stephanie Patton as Aggie, Duncan Pickering-Polstra as Will Parker, Gideon Pickering-Polstra as Ali Hakim, Sydney Sears as Aunt Eller, Jaeden Stone as Ado Annie, Micah White as Slim, Faye Wooden as Armina and Haven Young as Kate. The rest of the case ensemble includes Karison Bennett, Kelly Brown, Tatum Burns, Skylar Carson, Celena Carter, Jeremiah Carter, Chris Cronan, Cade Dotson, Trinity Edenfield, Michael Ferguson, Derek Fraley, Sarah Gabel, Madison Hensley, Alan Hernandez-Araujo, Jase Huffman, Samantha Jones, Aidan Kirk, Ethan Kirk, Maddisen Mikkelsen, Chloe Newman, Emmy Newman, Marshal Newman, Kathryn Ogden, Isabella Patton, Savannah Price, Nyssa Reno, Madalyn Ross, Logan Savage, Molly Smith, Samantha Smith, Olivia Swackhamer, Hannah Taylor and Aubree Vance. The behind the scenes crew includes Annaliese Fite as stage manager; Ethan Brown as stage right area manager; Nevaeh Colville as stage left area manager; Madison Younker as sound assistant; Samantha Parker as light assistant; Kaylee Carder as makeup assistant; plus Abby Archie, Zack Cox, Abigail Gibson, Payton Howell, Andrea Kelch, Elena Pickering-Polstra, Rebecca Rust and Kiley Wise. The musical is being directed by Jeff and Jenna Horick. Others involved include costume design and creation by Sandy Cruea; costume assistants Celia Griffin, Doris Edenfield, Trinity Edenfield and Linda Van Groll Wooden; set design by Jeff Horick; and set construction by Jeff Horick, Mark Holmes, Ethan Brown, Neveah Colville and Jon Polstra.